Heavy Fire: Black Arms is another entry in the arcade style rail shooter series. 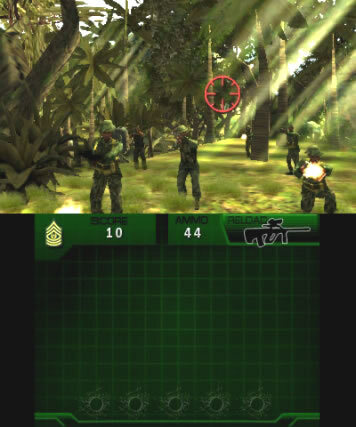 The previous entry in the series ‘Special Operations’ was a modern warfare game that took place in a bland Middle Eastern setting, however in contrast ‘Black Arms’ takes place in an illustrious South American jungle. If you are familiar with ‘Special Operations’ you’ll have no problem picking this up as the engine and interface are identical. It’s pretty much just a feature length expansion pack. Even the title screen music is exactly the same. For anyone not familiar with the series the aim of each mission is simply to survive until your character reaches the end of a stage. You have no control over the character’s movement so all you need to concentrate on is the combat. While storming through the jungle you will be ambushed by enemies from behind trees, long grass, huts, armored vehicles etc. which will test your reflexes and your aim. You will have to be particularly sharp in this edition as the South American soldiers are far more aggressive than those in the Middle East. The combat is very comfortable to control. The gameplay takes place on the top screen and you move a cursor by dragging your stylus around the touch pad. The 3DS touch-pad is sensitive, responsive and very accurate, reminiscent of playing a shooter on a PC with a mouse. You fire the guns using either of the trigger buttons so if you’re left or right handed you can still comfortably hold your stylus in one hand and shoot with the other. You can reload your gun with either the circle pad or a face button. Since reloading takes a little time to do you will be left vulnerable to attack, so strategically timing when you reload is key to success. When I started the first mission I had mixed feelings about the graphics. At first I was pleased with the shift in location as the jungle looked far more interesting and exotic than the previous desert setting. However it was instantly apparent that the developers had been overly ambitious with some of the special effects. They had attempted to create some dynamic lighting with sun rays bursting through the branches of the trees, however due to the 3DS hardware limitations this wasn’t executed authentically and the beams didn’t move convincingly. Immediately after discovering the poor lighting I entered a stream which also didn’t look great. The stream looked more like a solid muddy brown road with waves of white lines running across it. I later discovered that the reason the developers had to be ambitious with the special effects was because they were in fact scaled back from the Wii version. Although the Wii version still looks a tad PS2 it was clear that the lighting, water and foliage does look a lot more convincing than the 3DS edition. Graphical imperfections aside, the jungle is a great setting for combat with some interesting set pieces. New to this edition are a few sniper sequences which are always fun as there’s no chance of getting hurt and it gives you a chance to clear a few enemies from the stage before getting stuck into the thick of it. This edition is also far more explosive than before with more barrels and trucks to blow up, attack helicopters and like before there are a few mounted gun segments thrown into the mix. However if there is one thing that makes this game inferior to its predecessor it’s the level of difficulty. Overall Heavy Fire: Black Arms 3D is harder then Heavy Fire: Special Operations and not in a fun, challenging way but in a frustrating and annoying way. In the previous game the stages increased in difficulty gradually. There would often be plenty of enemies on the screen, although few of them would pose any immediate threat of attacking you. I enjoyed this as it kept the action flowing yet you still had to keep your finger on the pulse regarding any potential dangers. As you got to the later levels you begin to notice less cannon fodder on screen and more threatening enemies. By the time you got to these stages there was very little margin for error and you had to be extremely tight on the trigger. You also had to be exceptionally careful about when you choose to reload. Unfortunately in the case of Heavy Fire: Black Arms the difficulty of the stages is very erratic, with waves of enemies who pose an immediate threat appearing right from the beginning. Personally I struggled for about 45 minutes trying to beat the first mission, facing the same obstacles over and over, only to beat mission two on my first try! I couldn’t understand the logic of placing such a tricky level at the beginning of the game as it has the potential to put off a lot of players. Missions can last up to about 8 minutes with no health packs or check points, so tough levels frequently mean having to attempt the same battles multiple times. Since there’s no variety in the gameplay it’s not as if you can experiment with different strategies when you get stuck. As a result the senseless arcade action I enjoyed in Heavy Fire: Special Operations seems to dwindle into mindless frustration in this edition. Since the game runs on exactly the same engine as the previous title all the previous pros and cons are still present. On the plus side the game is still very smooth, responsive and comfortable to control. You also still have the option to reply previous missions for extra cash to purchase / upgrade / repair weapons. However the game is still as shallow as before offering very little variety in gameplay and lacking in ambition to develop on the theme. The sound in this game is equally as bad as before. Actually I think many of the sound effects (if not all on them) are the same. There is still no in game music and a lack of variety in the sounds & voice samples can grate on you very quickly. Overall the Heavy Fire games are good for a quick blast but do nothing to outdo the wonderful light gun arcade titles that inspired them. Although I prefer the look and setting of Heavy Fire: Black Arms I think most players would get more enjoyment out of Heavy Fire: Special Operations.